FV4005 unfair? op? annoying? one shot galore? The tank that has destroyed my Centurion AX is most likely the FV4005, with one damn shot or 1300+ damage every time with the stupid HE rounds..
How about you and your tanks? Edited by mikkiller, 05 April 2019 - 09:42 PM. CAX ammorack is in the lower plate, not really having issues with the ammorack in mine since I mostly play hulldown, issue with the CAX is its a TX med that doesn't have a gimmick. As for the FV4005, yes its broken and I'd also love to have it removed. WG are nerfing it, but it doesn't actually fix whats wrong with it (they're nerfing the gun handling and not touching the HESH) and imo is only being done to try and lower the amount of shitbarns being played. Didn't know it was in the lower plate.. But it takes literally nothing to get ammo racked in my case, might just be unlucky or play maps poorly. It's mostly just their HE that finishes my 2-5 minute long game and makes me return to the garage and yeah.. It has the same íssues as 183 had, just less armor. They should change it up big time or remove completely..
Edited by mikkiller, 05 April 2019 - 10:06 PM. FV working as intended. Git gud. well as its going to get nerfed into ground this year i sold my FV today after playing 470 battles in it, it was quite useful for missions, especially to get obj 260. It is a broken tank, because of those rng hesh shells, its not fun to recieve full dmg shot, but most of the time you cant really hit what you aimed for when you play one. its definitely the most expensive tank to run in this game, i have lost the count of how much credits i have spent with it lol. just wait for the nerf, after that you wont see them so often anymore. I want to get as far as possible in the marathon though..
FV might be expensive, but most of these people playing them have premium accounts and stacked cash..
UK tanks get ammo racked quite often. And regarding FV, yes it's broken. They need to lower the damage of HESH but WG doesn't want to remove it so you just have to deal with it. In fact FVs are quite easy to avoid, I play lots of paper tanks and I rarely get shot by 1. Even rarer to get 1 shot by a FV. People don't play it that often either, because for every shot that a FV pens, he had messed up at least 10 or even 20 shots before that, so it is a very expensive tank to play and only for lolz shots and memes. On flat ground and without angling that armor plate is around 200mm thick so the probability of damaging the ammo rack is high if you got hit there. Killing the driver is a bonus! As for the FV, it's a TD for people who can't be bothered to aim or for having fun on the expense of others and i am ok with the concept but 1750 alpha is just silly. If there was a way to show how many times a specific tank has destroyed someone or such, I can guarantee the FV4005 is a top contender on my account. It rarely looks like they miss. I agree and thanks a lot for spending time on showing me! losing 50-70k per battle is pretty much normal, if you use everything to make it a bit more playable, cause of terrible dispersion and aim time + module, crew damage you take. i would rougly estimate, that i have lost like 15-20mil credits during those 470 battles played. I didnt even enjoy playing it most of the time, its frustrating as hell to play for me, but it was pretty much impossible to do those td missions without having one. But to be honest the original deathstar was way more broken - when it had 280mm of hesh pen. got rekt by them in my first tier 10 (e100) every single battle, nowadays at least its very unlikely to get 2 shotted in a superheavy by FVs. Oh yeah.. time of the 183s.... So much fun.... (not) Actually, I had less trouble with them cause they were slow and played like Jg Panzers, these just stick out everywhere and fire. I'd rather have a nerfed FV 183 than the FV4005. The tank isn't unfair or OP. The people playing against are just bad. Just stop showing your side to them. Just took one down with 2 shots in my Type 4. This game is not broken and fv is too weak. 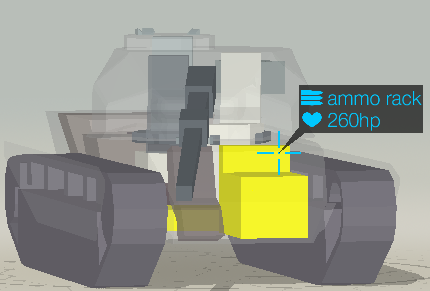 how is this tank broken? You get inaccurate gun, absolutely no armor (like skorpion g), your turret is the size of the building and you have no cammo, you are penned by tier 1 HE shells (!!!) in turret from any other angle except if your are hit in the gun barrel, you get high rng shells which cost you 8k per shot, and you make full dmg once per 10 shots. I mean, I have more constantly good games in T110E4 than in deathbarn. Deathbarn is just for memes. you cannot be OP in it. the only reason to play it is to get that once in ten full rng shot on tier X medium. other than that - one of the worst tier x tds. That's why I never go full HESH. I always use all my ammo types. When I go against super heavies there is no reason to load HESH. When I go against tanks that I know I won't pen with HESH but I can with AP, I load AP not HESH. I usually load 1 or maybe 2 HESH shells and usually in the beginning of the battle. After that everyone loses their HP and even if you pen with HESH it will be the same as AP or HE so again no reason to go full HESH. I usually earn a little bit of credit or maybe lose 10k. ​A broken tank has no middle ground. It's min/max tank. It either totally screws you over by missing shells or not penning the HESH rounds, or ruins your enemies. There is no middle ground. Like Type 5's armor. Immune to standard round and crap against premium ammo. Edited by DeadLecter, 05 April 2019 - 11:45 PM. Worst comment yet, thank you. It is beyond unfair and broken. A tank that can one shot vehicles in its own Tier at Tier X. And there tons of them in the queue. So yes, I can relate. P.S. : How some people are against SPGs but not against this is beyond me. INB4 "requires line of sight". That's exactly it for most people though. Arty can fire from complete safety, and while a TD can fire away from stealth if it's out of enemy view range or using bushes, it has to theoretically expose itself to danger. Since we're drawing parallels between arty and TD's, I find it quite amusing that the general complaint against arty (promotes camping by turning areas into no-go zones) can apply just as much to TD's if not more so. Most 0 arty battles I've had on Prokhorovka did not feature ultra-dynamic plays on the 1-2 line to name an example, and I'd personally rather hunt down three arty's than a single Foch B.
Edited by 1ncompetenc3, 06 April 2019 - 06:48 AM. Don't worry, WG is going to nerf it to oblivion and then you will have yet another worthless tier X TD. As much fun it is to penetrate a shot on a Maus, FV is not worth playing even it's "massively overpowered" state. You miss most of your fully aimed shots, you get murdered once you are spotted. The only reason I'd touch it is to try to get the magical 8k dmg game.